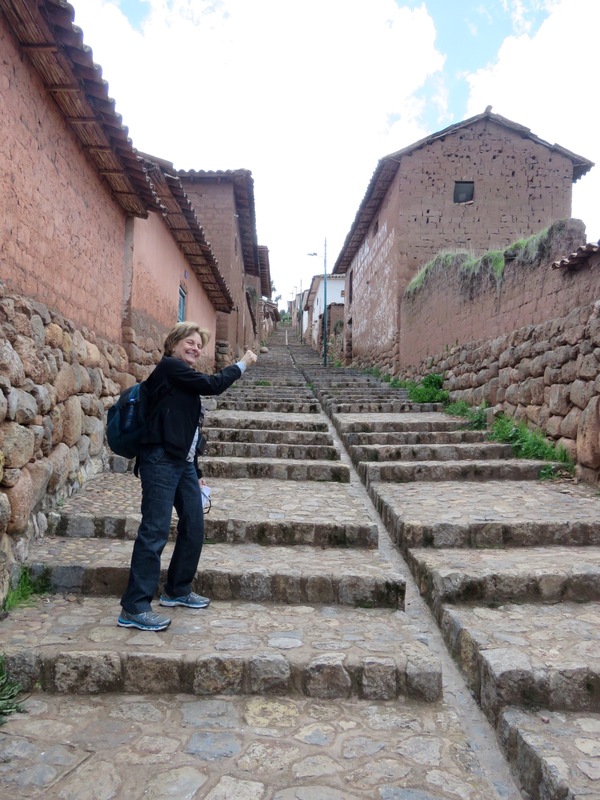 Saturday, Jan. 23, we drove about an hour into the mountains to the town of Chinchero, another sacred Inca site. As we passed through the outskirts of Cusco, we saw a street market selling everything from potatoes to clothes. As we rode through the countryside, we saw signs painted on the sides of houses, many of which are advertisements and others, election posters for the presidential elections coming in April. Here is one for Keiko, daughter of former (disgraced) president Fujimoro, who has managed to distance herself from her father. One town along the way got its name from the Spanish explorer Pissarro. The story goes that he was heading south to Cusco after conquering the last Inca kingdom in the north and had been traveling for a long time. When he came to a place where he wanted to stop for the night, he said, that’s enough—for today, which is por oy in Spanish. From that time on, the town was called Poroy. Because of the harsh landscape and high mountains, the Incan culture developed in relative isolation. The earth is sacred, and the Incans worshipped origin points at mountains, caves and such. About 98% of Peruvians are Catholic, the result of the Spanish conquest. They practice a unique version called Andean Catholicism that combines Andean beliefs, rituals, deities, and nature worship with traditional Catholicism. The sun, mountains, and earth are sacred elements. Patcha Mama is the Earth Mother, and related to the Virgin Mary, who is revered by Andean Catholics and considered equal to Jesus. Often Mary is dressed in a triangular robe reminiscent of the mountains. Patcha Mama is honored regularly; for example, when opening a beer, the drinker spills a few drops on the ground for her. Men and women treated alike in Incan culture. In Cusco cathedral, painting of woman giving communion to another woman! Work together in the fields. Both weave textiles. Communal culture. At Chinchero the Incas built a temple to the rainbow, which brings together the three elements of rain, sun, and earth. Supposedly this was the place the rainbow originated. When the Spaniards arrived, they of course imposed Christianity and built a church above the temple. The site has an impressive array of terraces that were built to allow better crop cultivation on the hillsides. On the way to our next stop we paused for a photo op. Aren’t these glaciers magnificent? At our stop this girl enjoyed posing for us with her llama. We then visited the Moray agricultural center, where the Incas built terraces to create microclimates suited to different crops. As little as 12 degrees altitude allowed them to experiment and see how plants can adapt. Isn’t this “bowl” of terraces an amazing construction? The Chinchero area is known for its weavers. Because the ancient Peruvian civilizations used drop spindles to weave, we know they understood the principle of the wheel. However, they never applied this to land vehicles, as they did not have animals to pull carts etc. (Thank you, Nat Geo, for that factoid!) There is now a center for traditional weaving arts in the Chinchero area. We had an extensive demonstration of how the wool goes from its raw stage to yarn using the drop spindle, then is dyed using only natural substances. I’ll continue in another post that is all about food! How many baskets did you buy and I am surprised you didn’t ask to stop at the street market. Love the pics and of course the history! Not baskets, textiles. Not my thing, didn’t buy. We get a gift in each place as well from NG, got alpaca scarves in Cusco. And re your earlier comment about my natural look, I really have no choice! My hair has been impossible and we have little time. None, they were weaving textiles. Lovely but not my thing. Cambodian silks, on the other hand…gorgeous!